Baloch youth have been victims of abduction, torture and extrajudicial killings by Pakistani forces for many decades, It has been a declared state policy implemented against Baloch youth, of which world is either unaware due to a total media blackout in Balochistan or have closed their eyes for their own interests. Some of Baloch youth who fortunately escaped from these brutalities to save their lives and settle down in middle east or some other neighbouring countries are now becoming targets and their lives are also in great danger as they are worried about their security. 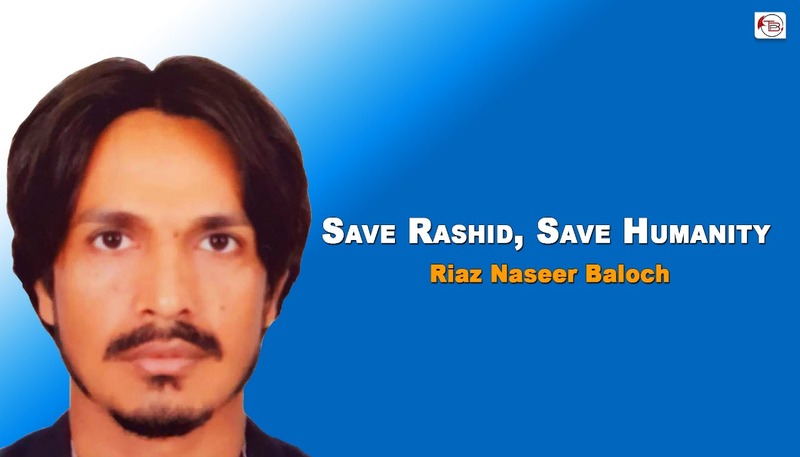 Rashid Hussain a 23-year-old Baloch student and a social media activist was arrested and taken to an undisclosed place by UAE secret agencies on 26th December 2018, while he was on a routine commute to work from Sharjah to Dubai with one of his friends. Rashid Hussain had been living in UAE for years and had no charges against him. He was living legally and never broke any laws of Emirates. A few days after his abduction his family was forced and threatened to hand over his passport. However, his family did not because the passport was not demanded through legal channels, and also because it will be a very dangerous situation if Rashid is deported to Pakistan. Rashid’s family has not been given any satisfactory response about Rashid’s whereabouts by UAE authorities. Pakistan has already killed Rashid’s very young cousin Majeed Zehri and his uncle Haji Ramzan Zehri. Rashid Hussain faced political persecution and possible death threats in his home country and was forced to leave his homeland. On Tuesday Pakistani media reported on behalf of DIG Karachi police as he alleged that Rashid Hussain was a major facilitator of Chinese consulate attackers in Karachi. However, they have not and could not prove any kinds of allegations on him, because Rashid never been to Pakistan in recent days. A month long disappearance of Rashid and misleading reports from Pakistan makes his family gravely worried about his life. Silence of international human rights organisations is giving impunity to Pakistani state to put fake charges on him and execute him like his other family members. Abduction of a Baloch youth by UAE Intelligence agencies and keeping him in secret custody without any charges will raise questions about their neutrality and historical relation with the Baloch nation. It’s a humble request and huge responsibility of Human rights organisations, human rights activists to raise their voices and appeal the UAE government to avoid taking a wrong decision on the lies and misleading reports by Pakistani authorities. Deportation of Rashid would certainly mean throwing him in the mouth of death.